This is one of my favorite paintings by J.S. Sargent. It isn't one of his better known works, but nonetheless it is an important painting. It is worth a close look because it reveals something about the artist few people realize. Sargent was a nascent Modernist and a formalist painter, an artist who might have felt perfectly comfortable painting as an abstract expressionist during the mid-20th Century. Sargent liked to challenge his audience with his innovative compositions, and he cloaked his most extreme experiments with his power of descriptive might. 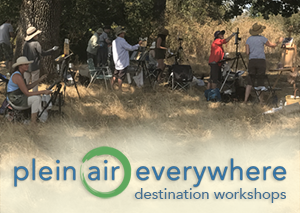 So I thought it would be fun to share why I believe this, and perhaps reveal a few of the mechanical nuts and bolts of painting at the same time. I first saw a reproduction of Home Fields in 1983 while still in college. I found it in a used book and it wasn't a particularly good reproduction. But it still had enough power to stop me from turning the page. I didn't know much about Sargent at the time. In fact nobody did, and I had only heard of him because he was in the process of being reintroduced (rehabilitated? re-assessed? re-inducted?) into the pantheon of great painters by a couple of noted critics who had become interested in Sargent during the waning days of Modernism. This being a time when many artists were beginning to become interested in more traditional ways of painting again, and starting to reject some of the fundamental precepts of Modernism. This is the painting that turned me into a plein air painter. The fresh and immediate handling of the paint, the observation of light, the unusual and bold composition resonated deeply within me. Home Fields became my touchstone. I spent hours looking at my reproduction, and then one morning I had an epiphany. I realized that Sargent had placed himself in the painting. (Oh snap! Can you see him?) Yet I have never heard or read anything in print which comments to this fact. But was Sargent truly a Nascent Modernist? . . . Yes. The underlying engine which drove Modernism can be summarized by the mid-20th Century edict: "Flatter than Flat." First, the Horizontals: Notice how Sargent placed the horizon line in the upper third of the canvas. That in itself is a modernist's touch, and it originates from the impact of Japonisme had on the French Impressionists fifteen years prior. Also, note the strong flat graphic rectangles Sargent created out of the shed on the right. He depicted the front face of the structure, and squared it up with the picture plane pf the image. (The picture plane I speak of is the surface of the painting. Think of it as the 'glass' in a window between you and the outside.) But there is something even more interesting about the shed for us to consider. Sargent purposely butts up the shed against the right edge of the picture plane. That position inhibits the illusion of it sitting in deep space and so the shed becomes a foil to everything else Sargent invests into the image. Or, everything else in the painting becomes a deliberate contrast to the static placement of that shed. Also, consider the row of trees arranged along the horizon line. They are dark, soft and have a varied edge. They have a broken silhouette. But those trees are purposely arranged to be in line with the shed. Together, they create a horizontal barrier which spans the picture plane. Again, flattening the illusion of deep space. 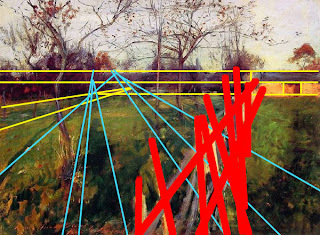 The Diagonals: Now, look at how Sargent exploits whatever elements he is offered in the natural world. In this case they are the shadows cast out in front of him. (BTW, Sargent is the longest shadow on the left.) Sargent uses this convergence to create a powerful movement into the picture plane, and interestingly, he takes us in a direction opposite to the shed. Convergence is a time-honored method for leading the eye. It's also a reach for deep space because the convergence is so extreme and comes together along the distant horizon line. (Don't be overly concerned about an exact convergence. This was painted en plein air and is not an architectural rendering.) 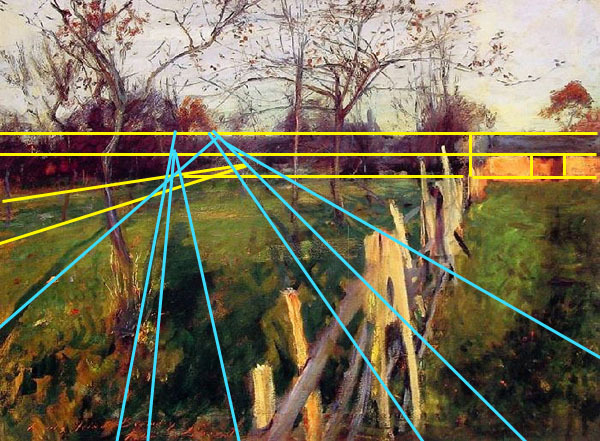 Sargent closely assigns the value of the shadows and the grass so they will combine together to create a flat ground plane -- which is again, an old-school approach to creating illusionistic space. As a bonus, due to Sargent's skillful handling of those shadows, we feel the time and position of the sun behind us. It's the end of the day. More Lines: So, when Sargent lays in the thin trunks and branches of the bare trees he is throwing up a barrier to experiencing a sense of deep space, for the trees are positioned closer to the fence line than they are to the distant horizon. In doing so, he creates a flattened way for our eyes to move from the foreground into the sky and back again without impediment. Again, Sargent finds and exploits natural elements. I hope I've managed to share a few reasons why I consider Sargent a Modernist without killing your appreciation for Home Fields. Because, like explaining a joke, 'splaining the art can kill the appeal. How much of Home Fields was premeditated vs how much of it was the by-product of a reflexive genius is in the end anyone's guess. But the modernist ploys Sargent used to flatten the his picture plane are there in the painting for us to see. If Home Fields was an modernistic anomaly then maybe we could view it as a happy collision between a savant and his subject . . . a lucky happenstance, perhaps. But I think not. Everything in the painting seems considered and calculated and Sargent offers up other similar compositions in his oeuvre as well. He clearly liked to experiment with his compositions in ways that would not reappear until after WWII, when non-objective painters such as Kline, DeKooning, Motherwell, Still, and others lead by the New York critic Clement Greenberg took the stage and dispensed with all that naturalistic nonsense. (Ha!) 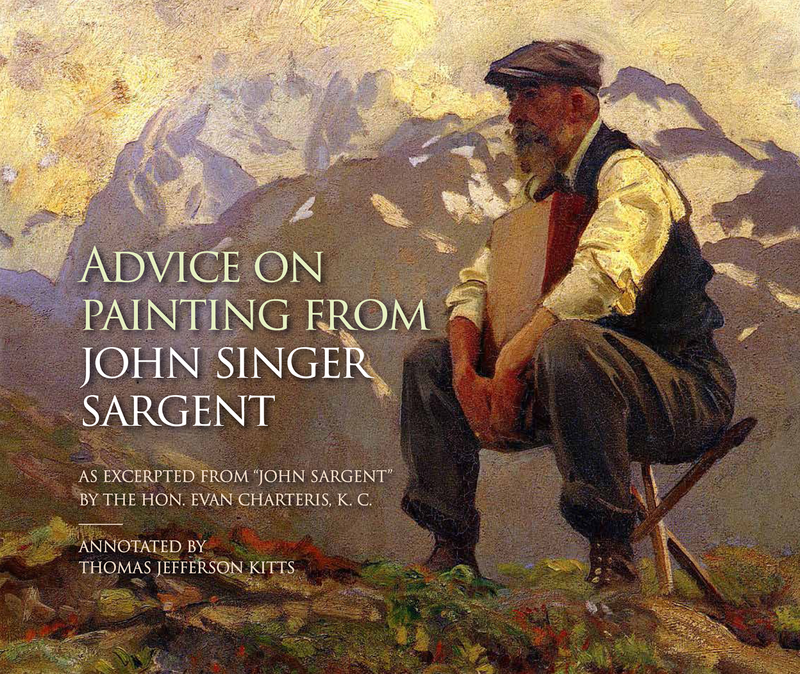 But in Sargent's case, it feels precent. He, unbeknownst to the rest of us, understood he was serving up Modernism under the guise of Naturalism. And so, maybe the joke was on us, eh? Oh, hey, and I am excited about Home Fields once again. For the first time in my life I will get to see it first-hand. It's currently on exhibit at the Adelson Gallery in New York City and I will be there in two weeks. I can't wait! Great lesson, Thomas! To me, the explanation of the painting makes it far more interesting. As a non painter, I can now understand why it's a work that I would linger on. It was a fun post to write, and doing so reminded me why I like Sargent's work so much. And Carey, it was nice to meet you at the Lumber Yard. Keep blogging! Holy Toledo, what a great post! I loved the painting at the onset--but after all the explanation, I love it all the more! Superb job--I am completely impressed. It will be awwwessome for you to see it in person. After reading this I want to see it too!